My game is freezing everytime I try to change the quest complete sound, haven't disabled other addons yet, but I have uninstalled and Reinstalled KT, tried to find the config save but no idea where it gets put. Edit:Disabled addons and the game still freezes. "Collapse in instance" doesn't work for me, even with autofiltering off, it sometimes still opens after some boss fights, wipe or trash killing. Can we get some setting to complitly turn off(collapse) this tracker in myth+ dungeon? When will Pet tracker be supported again? I see no pets on the BfA zones..
Is there any way to disable the 'whats new' popup? I really dont need to see that every time. "What's New" shows only when new version is installed and game run first time with this new version. Next runs don't show "What's New" any more. 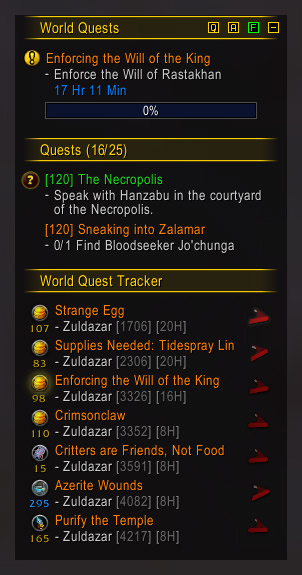 Is it possible to fix the bug that makes it so when you manually select worldquests they dont appear outside of Kaliels Tracker? 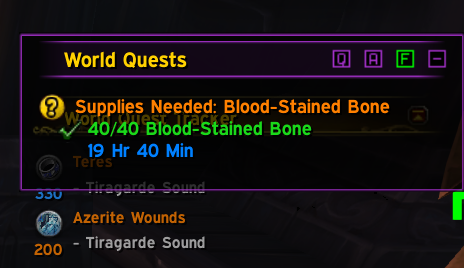 This is problem with World Quest Tracker. I'm working on support for this addon. Support is on testing now. Do you have a github with your testing versions that we can run and help you test? Sorry test version is not public. Here is preview image with World Quest Tracker support. Update: I found the play button. Sheesh, I am blind. Love your addon, but I since the update I am unable to revert the "Quest Complete" sound to default. The ability to change the sound is a nice addition, but for those of us who prefer the default sound it would be better to have the option. Thanks for all your hard work! Edit: Damn, less than a day and already fixed my problem! The latest update 3.1.0 broke Dugi's Guide for me, getting constant errors from it, if i go back to 3.0.4 it's fine. Now i know these are Dugi's errors, but they are caused by the recent update of your addon. DugisGuideViewerZ\SmallFrame.lua:827: attempt to index field 'DugisWatchFrame' (a nil value)"
I confirm this, sorry about that. I add Digi's compatibility but not was tested, because I don't use this addon. Fix is in progress, for more info watch this ticket. First of all, awesome addon. Love is a lot. But recently I have the issue that the golden shine that runs from left to right gets stuck in the middle. So part of the questlog line is with a golden shimmer while the rest is normal wich makes it kinda hard to read. Is there a way to turn that shiny feature off completely? I can provide a screenshot if someone tells me where to store. This is known issue, but this is property of default Blizzard tracker. I working on fix but, this visual bug is hardly replicable.